2017 One in a mill. How far would you walk at night for fear of violence? 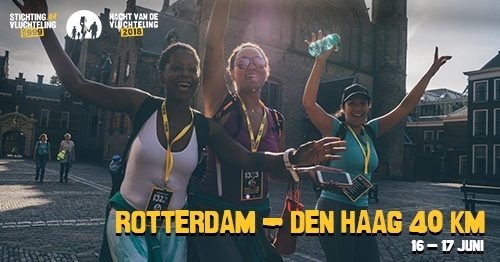 On Saturday the 16th of June 2018, at midnight sharp, thousands of people will start their 40 kilometre walk from Amsterdam to Amsterdam, from Rotterdam to The Hague, from Utrecht to Utrecht or from Nijmegen to Arnhem. They walk to raise funds for emergency aid for refugees worldwide, and to raise awareness for the situation of those people in need. Next to the 40 kilometre walks, an additional shorter walk will be held in the evening of the 16th. At the shorter walk, people of all ages, including children and families, are invited to participate and raise funds for refugees. This shorter 10 kilometre and 20 kilometre walk will be held in Amsterdam. Worldwide there are 65,6 million people fleeing from war, violence and oppression. All participants of the Night of the Refugee raise money for refugees and displaced persons worldwide.